Talking Tom and Friends Get Personal! Bulldog Licensing Inc has sealed a new deal that will see a range of personalised products featuring hit digital entertainment brand Talking Tom and Friends go on sale across North America. 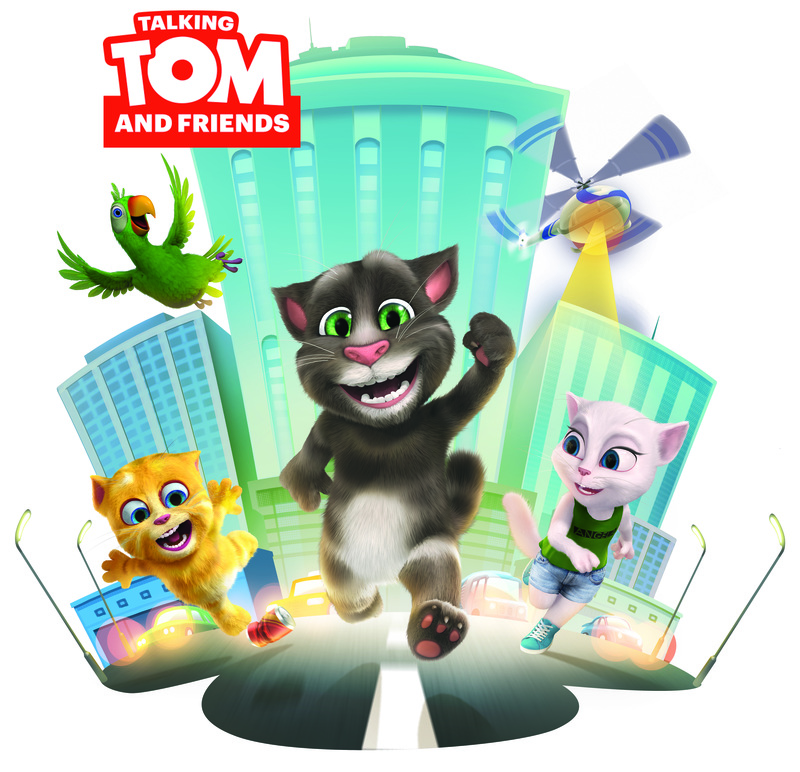 Talking Tom and Friends is the flagship brand of multinational entertainment specialist Outfit7 and is a trailblazing presence in the digital space, having recorded over 2 billion downloads of its apps since launch and boasting 240million monthly active users. The property features six characters – Talking Tom, Talking Angela, Talking Ginger, Talking Ben, Talking Pierre and Talking Hank – who star in a total of fifteen apps. However, apps are just the start – music videos featuring the characters have been a huge hit on YouTube, as have a series of web shorts produced in conjunction with Disney, underlining the brand’s incredible licensing potential. The recently launched new My Talking Angela app has seen the brand reach new heights around the world. The new agreement has been signed with SongsWithMyName Services Ltd, which will develop and launch a range of personalised music products, including CDs, DVDs and books, that will go on sale across the United States and Canada. Bulldog Bags Another Shopkins Deal! Bulldog Licensing has signed yet another licensing deal for Shopkins – the red hot collectible brand that has already built a huge presence at UK retail since launching late last year. Shopkins are cute little characters that live in Shopville and are irresistibly collectible. There are over 140 to collect in each series, including a ultra-rare special characters, and are sold inside adorable little shopping bags. Despite only being on the market for a few months the brand has sparked a fully-fledged craze, fuelled by an online presence that has seen over 13 millions hits on the Shopkins Youtube channel. Retailers across the UK are struggling to keep the line in stock and are having to airlift in new supplies to fulfil consumer demand. The new agreement will see the introduction of NJ Screen Prints Ltd on board for all daywear articles offering a clockwork speed production environment to retail with the support of innovation in garment decoration. The deal covers the UK and Eire and comes hot on the heels of a raft of licensing agreements for the property, with Pedigree (annuals), DJ Murphy (magazines), Winning Moves (Top Trumps games), Pyramid (posters) and Whitehouse Leisure (amusement plush) all joining the licensing programme. “Shopkins is one of the hottest collectibles out there at present and is topping the sales charts right across the retail landscape. This apparel range will have huge appeal and I’m confident it will be a strong seller when it hits the shelves,” says Bulldog Group MD Rob Corney. New Brand Licensing Partners Sign Up For LIFE! LONDON, NEW YORK – February TK, 2015 — Bulldog Licensing has announced details of two new brand licensing agreements for LIFE, one with 1wall.com coming on board for wall murals and wallpaper and the other with GHS studio for dog beds and beanbags. LIFE is the legendary brand that continues to enthral millions of people each week in its current incarnation, Life.com—a site that boasts increasingly impressive figures. In January 2015 Life.com generated over 881,000 unique visitors and 11 million page views. The LIFE photographic library is a vast collection of pictures, many made famous by the magazine itself and includes some of the world’s most recognisable photographs. These include snaps of legends such as the Kennedys and Winston Churchill, photos of historic moments like the moon landing or the Ali-Frasier fight, and incredible images of the world around us—ranging from shots taken in outer space to nature at its most powerful and beautiful. In total, around 8.5 million pictures are available to license and, with the iconic LIFE logo, present a fantastic merchandising opportunity. The LIFE property is going from strength to strength in the licensing sector and was recently voted amongst the top five most powerful art brands in the world by industry experts in the Licensing.biz Power List 2013. The new licensees will join a host of existing brand licensing partners, including Portico for gifts and stationery, VMC for accessories, Benchmark for bags, Pyramid for calendars and wall art and The Art Group for greetings cards and postcards. The LIFE brand is also massive in the apparel sector, with a range from Poeticgem selling right across the UK high street.